If the FBI is watching you for suspected terrorist links, you shouldn’t be able to just go buy a gun with no questions asked. Clinton’s proposal and others like it have met with criticism from civil libertarians and legal scholars, who argue that you cannot constitutionally deny citizens their rights without proving that they are guilty in a trial. 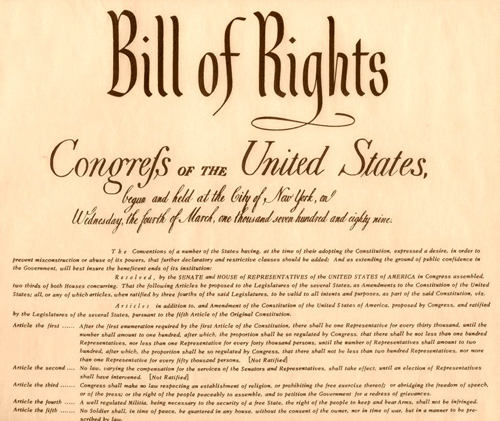 “We generally don’t take away rights based on suspicion” is how UCLA law professor and blogger Eugene Volokh puts it. Clinton evidently disagrees, likely believing that we as a society ought to be wary of anyone being investigated by the feds, even in the absence of a conviction. At the very least, she seems to think we should ask pointed questions of those the federal government believes put the national security of the United States at risk through their actions. Of course, Clinton’s comments come after the Orlando shooting Sunday morning, carried out by a perpetrator who was investigated by federal authorities but then removed from watch lists. So even if the federal government stops investigating a suspect, we may have to act on the assumption they broke the law anyway. America has an appalling, unconscionable, and unparalleled gun violence problem. The federal government has proven able in the past to pass gun safety laws—like rigorous licensing requirements and comprehensive backgrounds checks—that have proven to be quite effective at reducing gun violence. Much, much more can and should be done. For example, the federal government should also promptly repeal the outrageously unjust law that protects gun sellers across the country from legal liability when they negligently sell firearms to unqualified purchasers. And Congress should forbid manufacturers from selling weapons of war—guns that have no plausible purpose other than to slaughter vast numbers of humans in as short a time as possible. The Supreme Court’s ahistorical, atextual reading of the Second and 14th Amendments as guarantors of an individual right to bear arms may be deeply flawed. But limiting any right, no matter how specious, based on undisclosed, mistake-ridden lists is even more unsound. The Constitution is anchored by the promise of due process; so long as gun ownership is considered an aspect of liberty, the government must not revoke it unilaterally, with no opportunity for appeal. Civil libertarians should push to abolish the terror watch lists, not expand their reach. If the government can revoke your right to access firearms simply because it has decided to place you on a secret, notoriously inaccurate list, it could presumably restrict your other rights in a similar manner. You could be forbidden from advocating for causes you believe in, or associating with like-minded activists; your right against intrusive, unreasonable searches could be suspended. And you would have no recourse: The government could simply declare that, as a name on a covert list, you are owed no due process at all. This is hardly the only civil liberties problem with regards to Hillary Clinton. During the 2008 campaign Hillary Clinton was the only Democrat who refused to sign a pledge to restore Constitutional liberties. All the Republican candidates, with the exception of Ron Paul, also refused to sign. She introduced legislation to make flag burning in protest a felony while in the Senate, and has used language quite similar to Donald Trump in showing a lack of respect for freedom of speech. There is a special irony with Clinton equating being under FBI investigation with guilt here, considering that Clinton herself is under FBI investigation on other matters. By this logic, Clinton being under investigation should by itself be sufficient grounds to deny her the Democratic nomination. Of course it is much more reasonable to deny someone the nomination to be president than to deny civil liberties to large numbers of people. There has already been plenty revealed about her actions as Secretary of State which should disqualify her from consideration. Posted in Civil Liberties, Donald Trump, Hillary Clinton, Scandals, Terrorism. Tags: Civil Liberties, Donald Trump, Gun Control, Hillary Clinton, Scandals, Terrorism. RSS feed for comments on this post.. TrackBack URL.